were discovered by the great William Herschel in 1787. NGC 4631 The Whale at right, is an Sc-type galaxy and one of the largest edge-ons known to us. Its highly irregular shape is due to distortion caused by its companion, the elliptical dwarf NGC 4627 The Pup, riding atop its 'momma's' back. The two are interrelated as evidenced by a bridge of hydrogen gas between them. The Whale exhibits many blue knots indicating young massive stars, while the bright yellow of the central bulge, points to an old population of Red Giants. Note the dark filaments of dust running throughout. Can you see the red eyes and front fins of the whale? 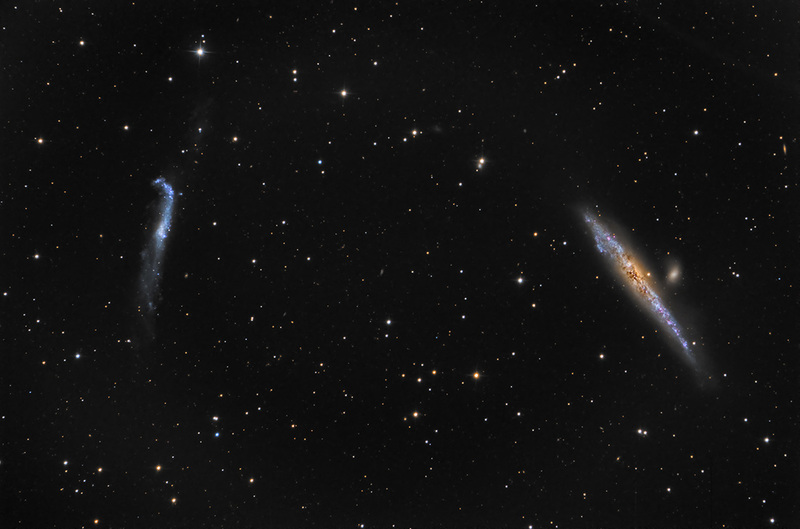 To the left is NGC 4656-4657, actually two interacting galaxies known collectively as the Crowbar or Hockey Stick. Note the dimmer extension above it, not seen in most images.